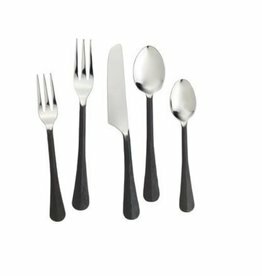 Our Woodbury Graphite Flatware Setting, part polished, part burnished, is the perfect complement to our dinnerware collections. Made from the highest quality industry standard of stainless steel, our beautiful Woodbury Copper flatware will make your table shine. Hand treated burnished finish to handles gives it a rustic look. The hand-treated burnished finish of our Woodbury flatware and serving pieces gives them a rustic look. They're the epitome of country chic. Dimensions: 1⅛" H x 2½" W x 10¼"